In this exciting novel set during the French Revolution, Charles Dickens expresses sympathy for the downtrodden poor and their outrage at the self-indulgent aristocracy. But Dickens is no friend of the vengeful mob that storms the Bastille and cheers the guillotine. As with all of his stories, his passion is for the unforgettable and unrepeatable individuals he creates. The sorrows of the suffering masses, their demands for justice, and the indiscriminate fury they unleash take flesh in Madame Defarge, while the self-sacrifice that is the truest means of atonement and rebirth manifests in the unlikely hero Sydney Carton. In A Tale of Two Cities, humanity does not show its best side in the mean streets of Paris or even London, but in the intimate circle of loyal friends that gathers around the honorable Doctor Manette and his lovely daughter, Lucie. About the Editor: Michael D. Aeschliman is Professor of Education at Boston University, Professor of English at the University of Italian Switzerland, and author of The Restitution of Man: C. S. Lewis and the Case against Scientism (1983, 1998). A widely published scholar and literary critic, he edited in 1987 a new edition of Malcolm Muggeridge’s 1934 satirical-documentary novel, Winter in Moscow. Writer and social critic, Charles Dickens (1812–1870) is a towering figure in the world of literature. 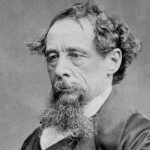 To quote G.K. Chesterton: "Dickens never talked down to the people. He talked up to the people. He approached the people like a deity and poured out his riches and his blood. This is what makes the immortal bond between him and the masses of men." His works include Oliver Twist, David Copperfield, A Tale of Two Cities, Great Expectations, and A Christmas Carol. 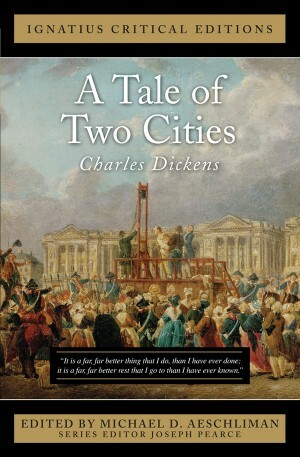 Find other books and articles related to A Tale of Two Cities.